John Colter (1774?-1812) – An American trapper and guide, Colter was born in Augusta County, Virginia about 1774. Sometime around 1780, Colter’s family moved to Kentucky near present-day Maysville. In 1803, Colter enlisted in the Lewis and Clark Expedition as a private with a salary of $5.00 per month. 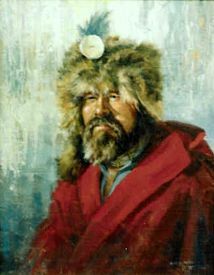 During the expedition, Colter was considered to be one of the best hunters and scouts in the group, and was routinely sent out to hunt game and scout possible trails. As the expedition was returning to St. Louis, Missouri in 1806, they were met by two trappers by the names of Forest Hancock and Joseph Dickson, who were headed to the Yellowstone River. Colter, not ready to return to “civilization,” was granted a discharge to join them, and the trio began the journey in August. The next year, as Colter was making his way to back to St. Louis, he met Manuel Lisa, and his party of trappers of the newly formed Missouri Fur Company. Colter was hired to guide them to the mouth of the Big Horn River. Once again, the mountain man turned back leading the party into present day Montana, where they built Fort Raymond on the Yellowstone River, a short distance above the mouth of the Bighorn River. In 1808, Colter teamed up with another former member of the Lewis and Clark Expedition named John Potts and the two began to trap in the region near Three Forks, Montana. Both were wounded in a fight with Blackfoot warriors as they led a party of Crow Indians to Fort Raymond. The next year, the men were once again attacked by the Blackfoot and Potts was killed. 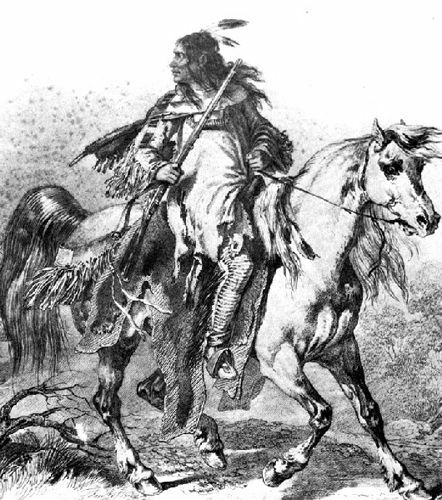 Colter was captured and amazed when the Indians set him free. However, before doing so, they stripped him naked and took all his possessions. Telling Colter to run, the mountain man quickly realized he was the object of a “human hunt.” A very swift runner, Colter eluded most of the group but one man was gaining on him. Turning and facing the Indian, Colter killed him with his own spear, took his blanket, and by hiding in the river under a pile of logs, was able to escape. For the next eleven days, he walked 200 miles back to Fort Raymond with only the blanket for warmth and survived on bark and roots to eat. When he stumbled into the stockade he was almost dead. However, the brave mountain man was nursed back to health. Still not ready to give up his life of adventure, Colter signed on to lead another Missouri Fur Company expedition to the Three Forks of the Missouri River in 1810. True to past experience, the group was attacked by the Blackfoot again and Colter finally vowed to return to St. Louis. Returning by the end of 1810, he had been away from civilization for almost six years. He furnished very valuable information to William Clark, who was compiling maps for the report of the Lewis and Clark Expedition and with his fur trade profits he bought a farm near New Haven, Missouri. He soon soon married a woman named Sally and the couple would have one son. However his quiet life as a farmer would not last. In 1812 the United States declared war on Great Britain, and Colter enlisted. 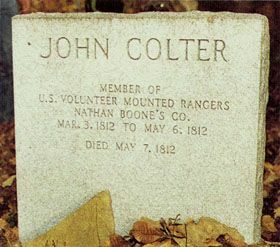 Fighting under Nathan Boone, he died while in service for his country. However, after such an eventful life, he died, not by the hand of the British soldiers or the many Indians he encountered in his travels, but by jaundice on May 7, 1812. After his death, his remains were shipped back to Missouri to his wife, who was said to have buried him on a bluff overlooking the Missouri River near New Haven, Missouri. Editors Note: It should be mentioned that while several sources indicate he died in May of 1812, there are others that show his death as November 22, 1813. Truly great and fearless men of renoun.